Organised by HIMSS and the Healthcare Informatics Society of Ireland and held at Dublin’s state of the art new Convention Centre from the 13-15th May 2013 the European eHealth Week will draw more than 2500 delegates and 64 exhibitors to Dublin and will be featuring a two day mHealth Symposium. 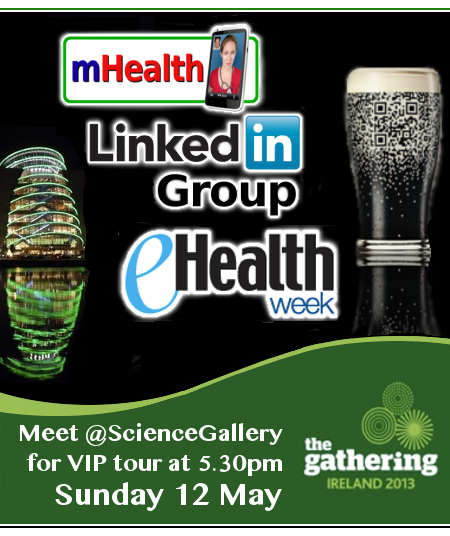 If you’ll be arriving before the event and have an interest in mHealth why not join members of the Linkedin mHealth Networking Group for an informal Céad Míle Fáilte (“a hundred thousand welcomes”) to our capital city on the evening of Sunday 12th May. As a prelude to the evenings networking join us at 5.30pm at the Science Gallery (click here to watch a video about this creative Dublin venue) where you will be provided with a 30 minute personal tour by Kieron Daly, CEO of Shimmer Research – a world leading wearable mHealth sensor company based in Dublin that has clients in over 60 countries in fields including Healthcare; Remote Patient Monitoring; Rehabilitation; Ambient Sensing Solutions and Sports Science. The current exhibition running at the Science Gallery will let you experience mHealth tech from Shimmer to test your pokerface, gauge your stress levels playing Jenga, and measure your fear levels… be ready for a surprise! The networking meet up is completely free to attend and all we ask is that you let everyone know you’ll be attending by introducing yourself and your interests with a comment below. NOTE: if you’re not yet a member of the 4000+ member mHealth networking group that we founded on Linkedin in October 2008 check out a who’s who of the group or click here to jump straight into the discussions, promotions and job postings and start getting yourself networked with the key professionals who are working on mHealth projects around the world. …3G Doctor, the mHealth Symposium, raising funds for your mHealth startup, people/places you’d like to meet/visit during your stay in Ireland, your mHealth plans and anything you’ve seen that we can do with the newest mass media to improve patient outcomes. Aggregating smart thinkers and even smarter technologies to LOOK, LISTEN, DESIGN, DISRUPT and TRANSFORM the current Healthcare ecosystem for the better. …Ascom & the future for Wireless Mission Critical Solutions in Healthcare. …the value of a Doctor in your pocket, how the adoption of consumer technology by Healthcare Professionals is going to transform the healthcare industry, Dublin (I studied medicine at UCD) and your visit during The Gathering. …Teledentistry and clinical smartphone photography. Lack of legislation for interjurisdictional diagnoses. Digital Dentistry. 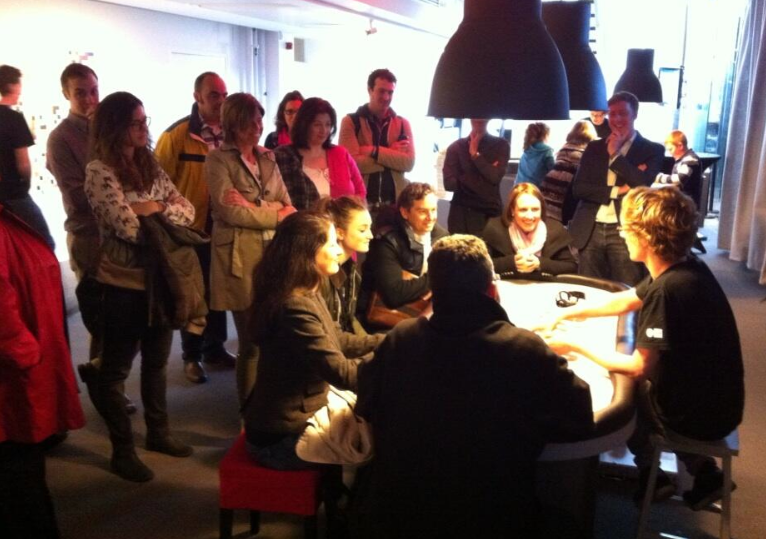 …patient education, what’s needed and how best to deliver it. …technology facilitating a lasting behaviour change in health behaviours, gameful design for mHealth, my company GetHealth, Health 2.0 Dublin, my role as a StartupHealth.com‘s Healthcare Transformer, corporate wellness, and consumer health! …ongoing mHealth projects (preferably in Sweden) to which we can contribute during practical placements while being master’s students on the Bioentrepreneurship program at Karolinska University. …Patient care pre and post visit. I am hungry for information around current models and processes. getting beyond pilots, breaking down barriers to adoption and empowering the patient..
…Document and PDF Annotation security and collaboration on the iPad seamlessly integrated into existing Enterprise Systems, a world first. …CE/FDA approved clinical decision support smartphone apps. We launched our first app ONCOassist in December. We are the 3rd company worldwide to get a smartphone app CE approved. …how mobile and digital allow the re-imagining of wellness and healthcare; quantified self and health; – and, if you’re a visitor, good places to eat in Dublin! …really excited to attend and to hear more about the use of mhealth – prevention, intervention of chronic diseases. Physiotherapist, trying to solve problems from the inside out. …Bringing together health care professionals, technology, innovation and patient advocates to make healthcare accessible to everyone regardless of ability or circumstances. ‘Ex’ nurse and ‘current’ Conference organiser I am always open to new ideas. 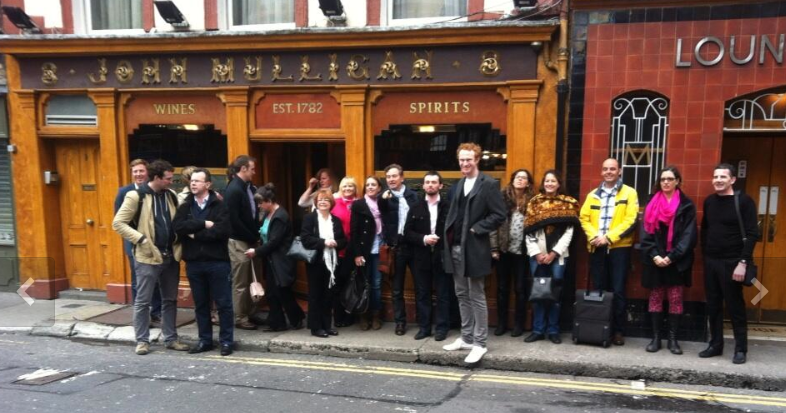 Proud to welcome our visitors to Ireland. …the innovative uses of technology for the management of Multimorbidity, and Learning, for healthcare providers and service users. Company is HealthCare Minds Ltd, a background in Nursing, and Co-organizer of Health 2.0 Dublin. Non-communicable disease prevention and management through mHealth technology using social and behaviour change communication. I am a medical doctor (general practitioner) who has worked in clinical settings in UK, Ireland and South Africa. I am also doing a PhD in Telehealth focusing on the above mentioned topic. Looking forward to connecting with all the keen, connected mHealth engaged people.